Want to sleep better when you have anxiety? Anxiety can cause insomnia, restlessness and nocturnal panic attacks – but never fear! Follow these steps for a good night’s rest. Today, I want to talk to you about how you can sleep better when you have anxiety. Now, anxiety disorder is something that can unfortunately impact the amount and the quality of sleep that you get. So if you want to sleep better when you have anxiety, you need to understand that it’s a vicious cycle – because if you are tired and irritable, that means that you’re more susceptible to anxiety. It means that your body hasn’t had the time to rest and restore and get nourished and really repair itself and you’re not able to present yourself in life the best way that you can. So it’s really a catch 22 and a self-feeding cycle when anxiety cause you to not get enough sleep but you’re not getting enough sleep because you’re so stressed and anxious. Luckily, I’ve got three very simple steps that will help you sleep better when you have anxiety by increasing not only the amount of sleep that you get but also the quality of the sleep that you get. These steps are completely natural and drug-free and they’re steps that you can start tonight. Use them when you want to sleep better when you have anxiety – use them to get a full and complete restorative sleep. Journal out all your thoughts, all your feelings, all your fears, everything that you have experienced throughout the day, write it down before you go to bed at night. Now, I find myself, I like to journal a couple of hours before I go to bed because if I try to journal too close to the time of bed, I tend to churn up all of these thoughts and feelings that I’ve experienced through the day. If you want to sleep better when you have anxiety, I suggest you do this too. It’s really important for me, at the end of the day, that I get the chance to unwind. I need a good couple of hours to do that before I even attempt to go to bed and try to sleep through the night. I find that journaling is a really useful way to get out all your thoughts and feelings and process everything that’s happened through the day. I also find that I get a lot of solutions to my problems through journaling. Sometimes, I’ll ask a question in my journal and before I know it, I’ve written the answer. It’s like the answer has been within me all along and all I need to do is write it all out on a piece of paper in order for the answer to come back to me. So if you want to sleep better when you have anxiety, and you’re stewing on a problem and that’s getting in the way of being able to have a full and restful sleep, then journaling can be a really good way to get everything out on a page and get some solutions. At the very least, it will allow you to process what’s gone on through the day and all the thoughts and the feelings that have gone along with that. If you want to sleep better when you have anxiety, the second thing that I recommend is that you wind down towards the end of the day with really low lighting. In my house in the evenings, I actually just have ambient lighting, using lamps. I have a lamp next to my bed and we have a lamp in our lounge room and our kids have lamps and we just keep the lighting really low and really chill. I find too much light towards the end of the day just over stimulates me and means that I have trouble switching off. I’ll often shower in the dark as well. It’s just so relaxing and peaceful – showering with really low light is just one less thing that my mind needs to deal with at the end of the day. I do find that the lower the light while I’m showering, the easier it is for me to just unwind and it’s a really nice roll that I start on before I go to bed. So, if you want to sleep better when you have anxiety, keep the lights low before you go to bed as well! I like to read at the end of the day. Now, what you choose to read is really important, if you want to sleep better when you have anxiety. I choose to read Jane Austen novels because they are quite predictable, and very, very gentle. Jane’s got very light and easy themes to digest. There’s nothing confronting or overly emotional or challenging in her writing. So, I find it a really nice way to relax and unwind and I think you will too, if you want to sleep better when you have anxiety. I’ve actually called Jane Austen my sleeping pill in the past because really, it takes just a couple of pages when I get into bed just to read through and I nod off to sleep. I download them for free at Project Gutenberg and put them on my Kindle. Light reading really does relax my mind and allow me to think about something else in the period between being awake and going to sleep. I find that the content of Jane Austen is just really nice and tranquil and peaceful and predictable and calming and comforting as well. So, that’s what I recommend, if you want to sleep better when you have anxiety. Reading anything that’s overly scientific or too textbook or too challenging is just going to amp your brain up again and that’s not what you want when you’re trying to relax and calm down at the end of the day and wind down into a nice peaceful sleep. 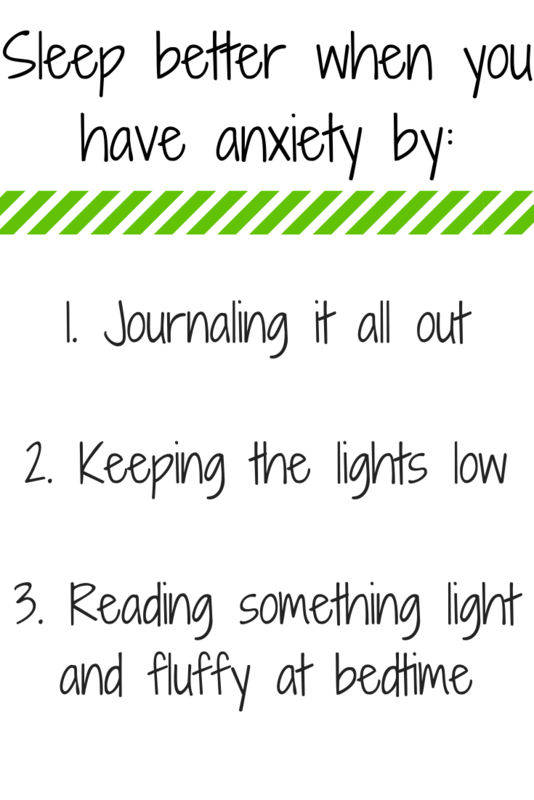 So those are the three steps that you can take when you’re trying to sleep better when you have anxiety. There’s another thing that you can do and that is grounding. I have an excellent free grounding meditation that you can listen to, and it will take you through the steps that you need to ground and anchor your energy in the present. It stops your thoughts and your energy from floating around out there like space junk, brings everything back into you and allows you to connect with the core of the earth again. Grounding is what you want when you’re winding down and trying to relax and get a full energizing and restorative sleep at the end of the day. Tonight, follow the above steps to sleep better when you have anxiety, and have a nice, wonderful and relaxing peaceful sleep.